Under that gimmick he kept always distance respect towards the hierarchy and career of Huracán Ramírez. The idea of Martin Karadagian came out after hearing Fabia's last name "Ventoso" which means windy. As Huracan Fabi he was known in the big leagues as promising wrestler. Another gimmick was Leon-O, he used that gimmick on 1988 at Titanes en el Ring. When he went into the promotion of Rambo y sus Titanes from 1990 until 1991 he changed his gimmick to Apache Chief. That troupe made a tour for all over Argentina, it was a great success. His next character was the young and modern Alex Corazón de Metal at Lucha Total (1993) and Lucha Mundial(1995). This gimmick was strongly based on the skateboard and Guns N' Roses. While he was not at televised shows, he never stopped working at different wrestling promotions. In 1997 he returns to Titanes en el Ring this time headed by Paulina Karadagian (Martin Karadagian's daughther). In this opportunity his character was El Hacker, a gimmick inspired in the phenomenon of informatics. He received the crowd's aceptance, and he also held a notable feud with Kanghai el Mongol. 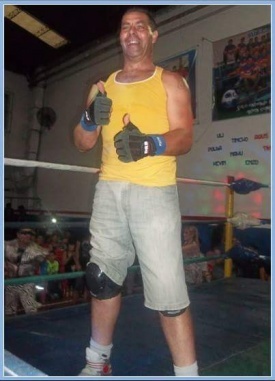 In 1999 he participated in the soap opera Cabecita he played a pro wrestler named El Cuartetero, as part of his entrance he danced with cuarteto music, a popular genre from the province of Córdoba. He was cast once again for the Season 2001 of Titanes en el Ring. This time he went as R@m a spin off of his former gimmick. His was regarded for his highflying maneuvers. Fans enjoyied his style once more in the first season of 100% Lucha as Johny Wave, a wrestler surfer. As part of his entrance, he arrived with a surfboard and two ladies in bikini. After that in 2009 he went into a very similar character in Guerreros del Ring as Fabi el Surfista. During that season, he took the mantle of Caballero Rojo. There is one more character in his career that he personified at Gigantes del Catch on 2012. That gimmick was Douglas la Aplanadora, a construction worker turned into a wrestler. He had participated in special events. There is one in particular in which he made a comeback as Alex Corazón de Metal in the Special Event promoted by Pibe Alfajor, Lucha al Límite. He teamed up with Comandante Zebra against Bad Boy & Comando Boina Verde in an spectacular match in which he demonstrated his wrestling style was intact.